Offering helpful advice to a friend is often human nature at its best. When that advice comes back to bite the very person who offered it in the first place, well, it can be a cruel twist of fate. Just ask Paul McCartney. 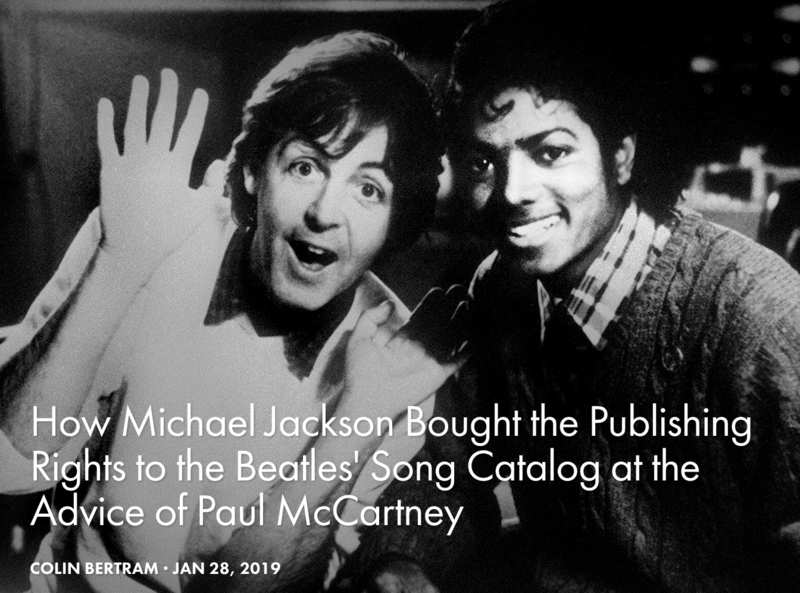 The Beatles singer/songwriter found himself to be on the wrong end of the above scenario when words of wisdom he imparted to friend Michal Jackson came back to haunt him over rights to the Beatles song catalog, which Jackson would acquire in 1985. 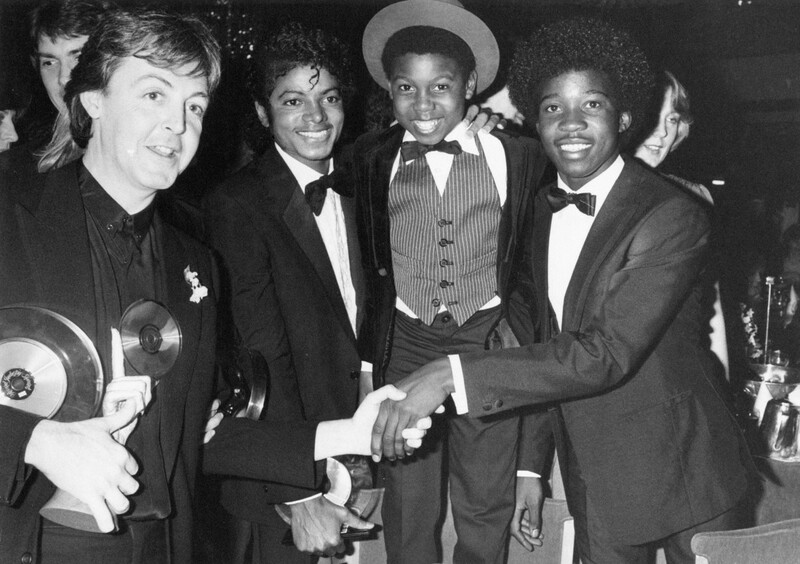 McCartney and Jackson became friendly in the mid-1970s when they met to discuss possible songwriting collaborations. The two would eventually go on to have hits with the duets “The Girl Is Mine,” the lead single from Jackson’s hit album Thriller (1982), and “Say, Say, Say” that was featured on McCartney’s album Pipes of Peace (1983). It was during this period of mutually advantageous collaboration that McCartney reportedly explained to Jackson just how lucrative music publishing rights could be, especially in light of the fact that in the late 1960s, McCartney had lost his stake in Northern Songs, the publishing company he set up with fellow Beatle John Lennon. Having penned many of The Beatles’ biggest hits, McCartney was understandably unhappy that he no longer received full and ongoing compensation from the catalog. Perhaps in an effort to regain some territory in the equation, McCartney had begun to acquire the rights to other artist’s catalogs (including Buddy Holly’s) and explained to Jackson the advantages of owning the rights to music already beloved by the public. 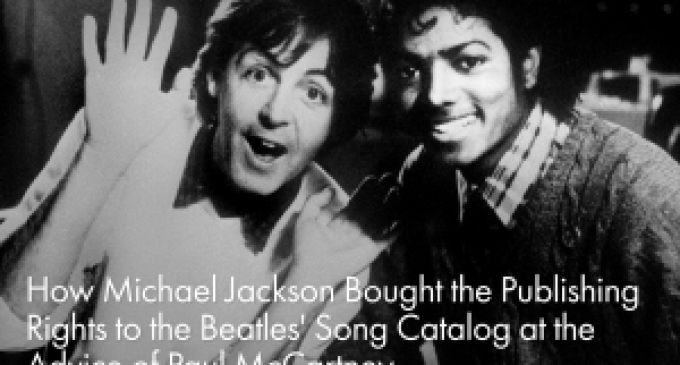 Taking the information to heart, Jackson used to joke to McCartney that one day he would own the former-Beatle’s songs. McCartney believed his friend to be joking, but in 1985 the joke became a reality and the friendship fractured. By the mid-1980s the Beatles catalog had come under the ownership of company ATV, which was headed by Australian billionaire Robert Holmes a Court, who appeared ready to offload the prized collection to the highest bidder. ATV owned the rights to 251 Beatles songs, including “Hey Jude,” “Yesterday” and “Let It Be, as well as 4,000 other songs and a library of sound effects. Jackson instructed entertainment lawyer and manager John Branca to purchase the catalog on his behalf. Branca reportedly approached McCartney and Lennon’s widow Yoko Ono to ascertain their plans, if any, regarding the proposed sale but was told neither would be bidding. In late 1984 Branca made an initial offer on behalf of Jackson to ATV of $30 million, which would eventually be increased to $46 million. Negotiations stretched into the following year with Jackson and Holmes a Court moving towards and backing away from the deal numerous times, with Holmes a Court’s lawyers initially fearful that Jackson was bidding for his friend McCartney. While not the case, the negotiations continued until Jackson increased his bid to $47.5 million and on August 10, 1985, the deal was completed. A decade after the initial deal, Jackson sold 50 percent of ATV to Sony for $95 million, creating the music publishing company Sony/ATV that today owns rights of not only Beatles songs but others from artists such as Bob Dylan, Marvin Gaye, Lady Gaga, Taylor Swift, Hank Williams, and Roy Orbison. Seven years after Jackson died, Sony/ATV agreed to pay $750 million to the late performer’s estate in order to buy out the remaining 50 percent stake in the company. The Beatles catalog alone has now been estimated to be worth in excess of $1 billion.